Wine writer Jancis Robinson is known for big books, such as the 912-page Oxford Companion to Wine (currently in its fourth, much-revised edition) and the 1280-page Wine Grapes (which won every major wine book award in the year of its publication). Perhaps that’s one reason her newest title, which just came out in the US, is so compelling: how much of her 40 years of wine experience could she possibly cram into just 111 pages, between two tiny 5” x 7” covers? As you might have expected…quite a lot. 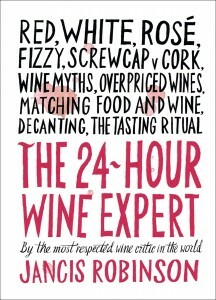 To celebrate the publication of this new hardcover version (the first was a paperback published in the UK in February), Jancis’ New York publisher Abrams, has given me five copies of The 24-Hour Wine Expert to give away. With corkscrews! Yep, to enter simply leave a comment below. Five lucky readers will get a copy of the book and a corkscrew to match. When I caught up with her last week, Jancis was up in Châteauneuf-du-Pape, where she told me she had just finished tasting some 175 vintages. To learn more about her background and accomplishments, read her shortish Wikipedia bio here or the full, amazing one here…but be forewarned: whatever you’ve done with your life, you’ll feel like a total slacker if you do! This new book, Jancis says, is for people who like wine but don’t feel quite sure of themselves in a wine shop buying for a dinner party…or in a restaurant, wine list in hand. “It’s for people who want a shortcut to the essentials,” she says. Topics include how to select the right bottle at retail; understanding the properties of color and aroma; what the different shapes of bottles and their labels tell you; what terms like “full body,” “supple,” “round” and “nose” really mean; what wines pair well with foods such as pizza, sushi or Thai; what the terms organic, biodynamic and natural mean in the wine world; how to chill and warm wines; and much more. And what about that perennial question about how price correlates to quality? As in, how much do we really need to spend to get a good bottle? Sound good? Then leave a comment below (click where it says comments) for your chance to win a copy…and a corkscrew! If you have a wine anecdote to share, even better! And please be sure to include your email address or we can’t reach you if you win…best is to put it right in the body of your comment text. “We have three exceptional children vintage-dated 1982, 1984 and 1991…” Dedication to her work even in her vocabulary! Her bio is truly dizzying, as you suggest in your article. Sounds just the book I need to read, as I’ve always found buying wines and in particular ordering them in a restaurant a minefield. We recently were in the Minervois area to look at houses. On arrival we went to the supermarket to buy provisions,including wine of course. We always like to try something local and bought a few from a village a couple of kilometres from our gite. After 10 days of house hunting over a wide area, we eventually had our offer accepted for a house in a village close to where we were staying. Yes, it was the same village from which we had tasted and enjoyed their wines. Perhaps it was fate, or my head following my taste buds. 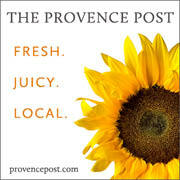 We are looking forward to continuing to buy local!